In the little college town where I began my teaching career, there was a beautiful Victorian house still occupied by the daughter of it's original builder. Doctor Holroyd. In it's front parlor, this little lady gave piano lessons to boys and girls until well into her eighties, sharing her gift of music with literally hundreds of students over the years. 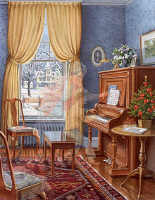 Even though I did not know her personally, a story I heard delighted me and has kept her in my mind since: Well past " normal retirement age,' Miss Holroyd had ordered a new grand piano to replace her aging Baldwin upright. Finding it impossible to negotiate the entrance hallway, the piano movers were obliged to remove a bay window and bring the thing in through the large hole in the wall. Miss Holroyd could not bear to watch, but when the piano was safely set up in it's new home, she came back and played a short recital of Chopin for the men. Following appropriate applause, one of the crew, a very large black man, reciprocated by sitting down and playing for her a set of blues. 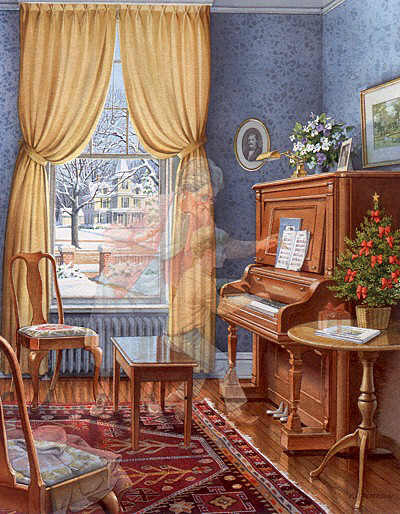 I love that picture, I suppose the house showing through the window and the Chopin on the piano are my private little reminders of that delightful event. I think most of us remember our piano teachers with a certain amount gratitude. Obviously, very few students are destined for the concert stage, but many do continue to play for a lifetime. Even those of us who do not enriched with a better appreciation of a majestic art form. In Piano Lessons I tried to paint a lady true to the spirit of dedicated piano teachers like Miss Holroyd, diligently sharing her devotion to music with a firm yet gentle hand. Thank you to you all for filling your communities with music. 2500 signed and numbered 24" x 18.5"
2000 signed and numbered 16" x 12.5"